Since October 1995 Teller’s has been serving the Hyde Park community. 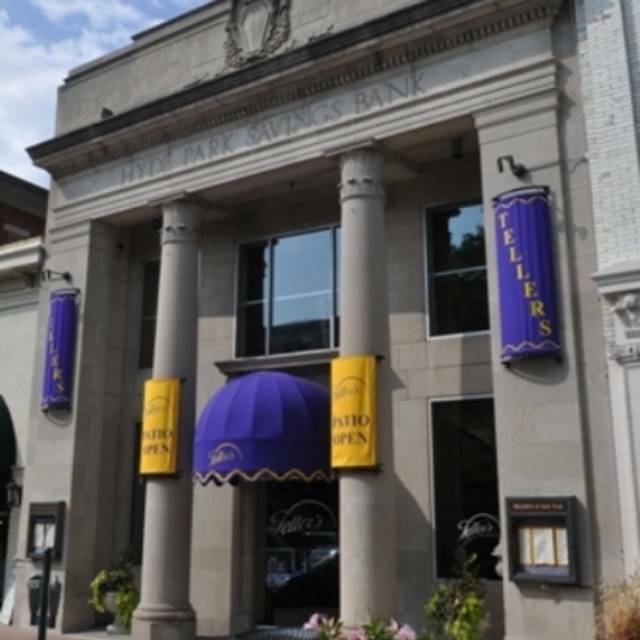 Located in the historic Hyde Park Savings and Loan building, Teller’s offers incomparable ambiance, knowledgeable and attentive service and an innovative menu to provide our guests with one of Cincinnati’s finest and unique dining experiences. The spacious interior, remodeled in 2009, is accented with warm colors and bright skylights. Teller’s expansive bar serves 30 beers on tap, 20 wines by the glass and over 120 bottle wines. 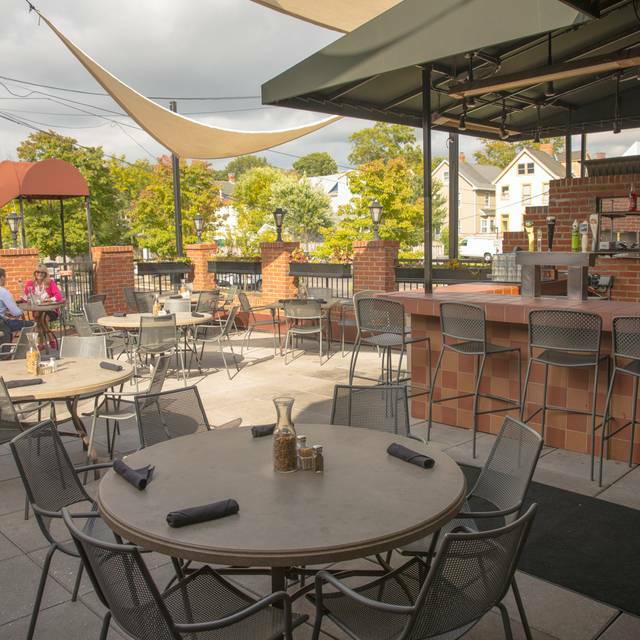 Weather permitting, enjoy our second story outdoor patio, rated one of Cincinnati’s top outdoor dining venues. Unfortunately, due to the unpredictable weather, we are unable to take reservations on our patio. Our patio tables are available first come, first serve, for all of our walk in diners. cannellini bean hummus, herb tapenade, and zatar pita bread. mussels, chorizo sausage, shallots, roasted garlic, white wine cream sauce, and toasted baguette. french fries, pepper sausage gravy, smoked mozzarella, fried egg, and jalapeno relish. baked brie, roasted garlic, apple cranberry chutney, and flatbread. french green beans, pickle spice, and toasted almonds. grilled chicken, cheddar cheese, chipotle, poblano pepper, sweet chili sauce, guacamole, and pico de gallo. grilled chicken, pepperoni, mozzarella, zucchini, buffalo sauce, and gorgonzola. shrimp, creole sauce, and toast points. tomato-red pepper coulis, goat cheese, and toast points. romaine, cucumber, white cheddar, tomato, red onion, croutons, and creamy herb dressing. bibb lettuce, fried chicken tenders, cucumbers, grape tomatoes, pickled red onion, and point reyes' blue cheese dressing. almond crusted goat cheese, strawberries, spinach, arugula, and raspberry vinaigrette. grilled chicken, spring mix, asian vegetables, almonds, and sesame miso dressing. bistro steak seared medium rare, brioche croutons, roasted shallots, cucumber, spring mix, tomato, fresh mozzarella, champagne vinaigrette, and balsamic vinaigrette. grilled chicken, guacamole, white cheddar, roasted tomato salsa, chipotle aioli, pico de gallo, and stirato bread. turkey, bacon, iceberg lettuce, tomato, mayonnaise, white toast, and rosemary spiced potatoes. blackened chicken, roma tomato, caramelized onion, iceberg lettuce, chipotle aioli, and french fries. eight ounce black angus, ham, jalapeno cream cheese, cumin fried onions, rodeo sauce, texas toast, and french fries. Korean spiced pulled pork, kimchee, carrot, cabbage, tzatziki sauce, scallions, and sesame rice. turkey, horseradish mayonnaise, apple, cranberries, sharp cheddar, balsamic onions, flatbread, and rosemary spiced potatoes. creole spiced crimini mushrooms, chorizo, gorgonzola, raosted red pepper, smoked mozzarella, avocado, and scallions. balsamic onion, fig jam, goat cheese, fennel cured bacon, smoked mozzarella, and walnuts. horseradish potatoes, white cheddar, smoked mozzarella, red onion, banger sausage, bacon, and scallions. artichokes, roasted red peppers, feta cheese, kalamata olives, roasted garlic, pesto, pickled red onions, smoked mozzarella, and toasted almonds. basil, fresh mozzarella, smoked mozzarella, tomato, roasted garlic, and marinara. pepperoni, italian sausage, smoked mozzarella, and marinara. andouille sausage, shrimp, chicken, red pepper, and a cajun cream sauce. grilled chicken breast, roasted garlic, rosemary, fennel cured bacon, roasted red peppers, spinach, and chicken glace. lime cilantro fettucine, mushrooms, spinach, chipotle roasted garlic, tomato, onion, feta cheese, and parmesan. molten chocolate cake with homemade marshmallow. vanilla ice cream, and caramel. pecans, dried cranberries, apple, and brandy cream. Our server checked in maybe twice? He seemed like he hated his job. Brought us menus 15 minutes after we sat down. Hadn’t been to Teller’s in a long time. Food was very good. Only critique would be that the restaurant could use a remodel.... it is looking a little run down. Thank you to the amazing staff at Teller's for rescuing a bad evening! I cannot thank you enough for treating us so well. We waited over 10 minutes for any service. Food was disappointing. Overall bad experience and we will not be back. Nice place. The service was fine and the food was fine. The food was pretty good. Our server seems to have entirely too many tables, but he was friendly and helpful. Drinks were great! Our favorite place to meet in Cincinnati! We come from Cincinnati, Louisville and Indianapolis and meet at TELLERS! Everything was fine. Nothing special, nothing memorable. Brunch pizza was dry. Teller's was a nice experience. We were greeted warmly and instantly taken to our table which we had made a reservation for. Matthew our waiter was helpful with suggestions for those in our party having a difficult time deciding. We were able to have a leisurely and enjoyable dinner. Wonderful meal! Great service. Truly enjoyed the pork chop. They were out of the special and the Red Snapper, so I had to choose another dish that was not as appealing to me. It was good, just not what I was hoping to have that evening. The décor and furniture is very old and outdated. A chair was broken and we had let the hostess know. They put it back in place at another table. When they sat someone at the table, we let the hostess and server know again that the chair was broken. They removed it and we watched them put it at another table (again). Same thing, when they sat someone at that table, we let them know again that is the same chair we have already told them about previously that is broken. If a patron sat in that chair, they would have most certainly been injured. We dine here often and are generally pleased with all. This evening we were disappointed in the service. We requested an upstairs table as it's usually a little quieter. Unfortunately, we were seated next to a large table that became fairly loud. Nor were water glasses ever refilled. However, the service disappointment came at the end when we received our check. The waitress reviewed thoroughly how she took of the $10 coupon and how the new total was then arrived at. However, upon my examination of the credit card bill, she had run my card through with an amount of almost $100 more than our receipt. She had charged our credit card to another table's bill. When I brought this to her attention, she strangely didn't seem surprised at the mistake? She did apologize, as did the manager, but it seemed very odd, given she reviewed our bill in detail about the $10 deduction, yet didn't notice the different balances. Mistakes happen, but this all was very puzzling. The entire experience was overall positive. This was the first time I had eaten at Teller’s for brunch and was pleasantly surprised. I ordered the Italian omelette and it was delicious. The coffee was also very good. We sat at the bar and the bartender seemed to be having a very bad day. He was rude to the hosts and actually almost threw the check at us... he slid it to us as he was walking away and it bounced across the bar. Other than having to interact with this particular individual I would highly recommend this restaurant. Couple of friends gathered to catch up and share a meal. The server was patient and very helpful in selection of beers from a large list! The service and ambiance in Teller's of Hyde Park is fantastic. My only complaint is my steak was a bit dry and lacking in flavor. I'd be happy to visit again and try another dish in the future. We dined on a Saturday night, and the place was fairly empty. We felt the food was overpriced for the quality — three of us in the party, we all had pasta and two of us had one draft beer each — and the bill was over $100. I’d definitely pay that at a slightly higher-end restaurant, but this one, sadly, seems like its best days are behind it. We did not enjoy our experience at Teller's. Almost nothing went as expected. We had a table right in line with a fan. It was 20 degrees outside ...when the heat was on it was bearable, but when it was off it was like air-conditioning. My wife asked our server if it could be shut off and she said she would check, but never responded to it again-and it stayed on. Our server had to be asked if there were chef specials and then did not know the price of any. Food was meh... I had the rodeo burger on Texas toast, but have had better toast at Zaxby's for far less money. My wife had a sandwich as well. Nothing great, maybe just above Wendy's. Got our bill and tried to use my Living Social. See, when you buy a groupon or living social deal, the "deal" may expire, but the original value you paid lives on. Well, not at Tellers. Our $20 spend got us $6 off our bill for 1/2 an app? What a deal. To end our experience, we paid and left- never to return. Hadn’t been in years. Recommend the mussels and buffalo chicken rolls. My party was not impressed with steaks they ordered. Shrimp etoufee was quite good. We've never had Goetta before and there is a brunch dish called Goetta Hot Brown and it was delicious! And we shared a Bananas Foster French toast. Both were incredibly good. Hazel was a very nice and helpful server! We'd go back next time we're in Cincinnati. Tasty food,excellent service ,very nice atmosphere.And a great Happy Hour. The review is for the food and not the service because our waiter was great and checked back often. I had the chicken and waffle and my friend had the breakfast pizza. My friend said her pizza crust was very dry and all she could taste was the flour. She believed that it was just the recipe and not a kitchen mistake. My waffle was topped with an excessive amount of frozen whipped cream (a full ice cream scoop) that only made the waffle soggy. The chicken had a nice crunch but no flavor at all. Neither dish was inedible and the prices were very reasonable, but with so many good brunch options I don’t see myself running back to Teller’s anytime soon. Great place to have a casual long lunch! Really enjoyed finding them and their GF menu. Their GF Rodeo burger is terrific! We were there for brunch. Awesome bloody mary! Food was great. Only constructive criticism I would offer was there was a leaking ceiling upstairs and the bathroom was FREEZING cold. Cinci had just had a snowstorm the night before so maybe that factored in, but restaurant temp was fine, but felt like there was no heat in the bathroom. Had the special fillet. It was small and over cooked. Salad was great, as was the scallops, wine, and service. $38 for a small over cooked fillet was disappointing. I’ll remember next time and stick with the pizzas, sandwiches., and pasta. My boyfriend and my first date was at Tellers a year ago and we decided to come back for our year anniversary. We ordered the baked goat cheese (SO underrated), he got the burger, and I got the scallop tocino. Both of our entrees and the appetizer were ABSOLUTELY fantastic. The service was very good as well. There weren’t many people in the restaurant but it seemed kind of dead everywhere. The only thing I’d say I would have liked is if someone would have mentioned a happy anniversary since I put it on the app when I made the reservation. That’s not even that big of a deal. My date had a chili glazed salmon which was excellent but my filet was undercooked to my liking so I sent it back. After a few minutes, a server dropped it off and it was completely over cooked. A manager stopped by to apologize. I have to say he was the most professional manager that I’ve ever spoken with. He comped my filet, bought her glass of wine and offered us free dessert all of which weren’t necessary but greatly appreciated. Blown away by it. My server did an excellent job and she was very apologetic as well. Would recommend! Awesome place for dinner and cocktails. Hip vibe. Great food. We really enjoyed our chicken and waffles and Goetta Hot Brown. Food is very large portions. Server was okay...she didn’t really seem to want to be there, but covered all the basics (ie took order, brought food etc). This place is a little on the pricier side and I’m surprised to see the deteriorating ceiling given that this restaurant seems to be a little more upscale. Great service and food for a good price. And neat location. The staff was pleasant and accommodating, our server, Bobby, was great. Most likely will not return. We came to tellers for a late lunch / early dinner on Christmas Eve. They seated us upstairs which would have been fine, except, we were the only ones up there. Because of this our service was very poor. There were plenty of tables on the main level so I’m not sure why we were put upstairs which led to poor service. Thank you. This restaurant is a perfect date night . Quiet with good food and great atmosphere. Really enjoy taking my wife here. Went to the Sunday brunch ....there were 3 of us...had eggs Benedict...chicken and waffles and the French toast was wonderful. Great service and atmosphere. We went for an early lunch to catch up on old times and were treated very well. The service was good and the food was very nice- a bit too much salad dressing for my taste but that is the only reason I did not give it 5 stars. The ambiance was pleasant, yet not too loud. It was a great spot to meet as the area surrounding it is also vibrant. Absolutely loved my experience! 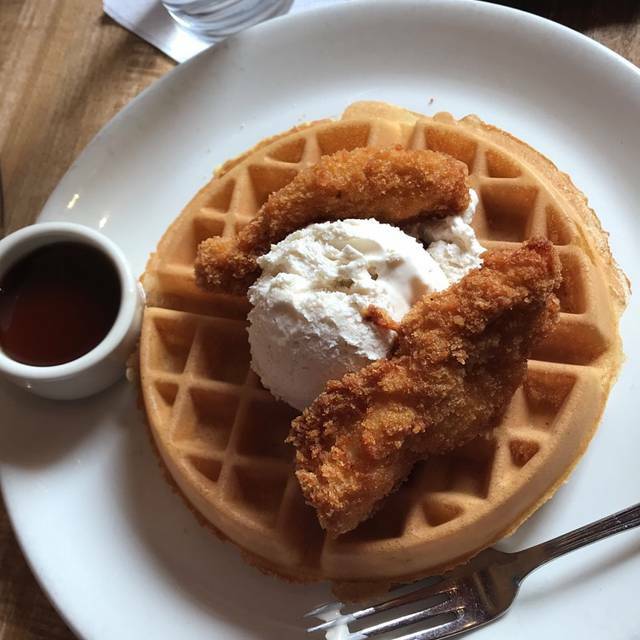 Sunday brunch is my favorite meal and their chicken and waffles did not disappoint! Nothing like having ice cream for brunch (it was my birthday so there were no rules!) The coffee was perfect too! Our server was fantastic and attentive!